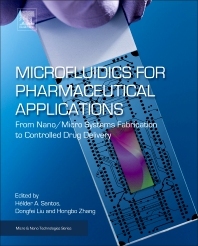 Microfluidics for Pharmaceutical Applications: From Nano/Micro Systems Fabrication to Controlled Drug Delivery is a concept-orientated reference that features case studies on utilizing microfluidics for drug delivery applications. It is a valuable learning reference on microfluidics for drug delivery applications and assists practitioners developing novel drug delivery platforms using microfluidics. It explores advances in microfluidics for drug delivery applications from different perspectives, covering device fabrication, fluid dynamics, cutting-edge microfluidic technology in the global drug delivery industry, lab-on-chip nano/micro fabrication and drug encapsulation, cell encapsulation and delivery, and cell- drug interaction screening. These microfluidic platforms have revolutionized the drug delivery field, but also show great potential for industrial applications. This book will be suitable for Masters and PhD students and for those in the industry. In addition, the book should appeal to a segment of academic scientists at all levels, from graduate students to professors, who work in related fields. Hélder A. Santos is Associate Professor in Pharmaceutical Nanotechnology, Principal Investigator/Group Leader, Head of the Division of Pharmaceutical Chemistry and Technology, Director of the Doctoral Program in Drug Research, and Head of the Preclinical Drug Formulation and Analysis Group at the Faculty of Pharmacy, University of Helsinki (Finland). Santos' research is focused on nanobiomaterials, including nanoporous silica/silicon materials and polymeric-based nanoparticles for controlled drug delivery, diagnostics and therapy. The research interests include the development of nanoparticles/nanomedicines for biomedical and healthcare applications. His current work makes the bridge between engineering, pharmaceutical and medical research. His main research focus is in the use of biodegradable and biocompatible nanoporous silicon nanomaterials, polymers, the application of microfluidics technology for nanoparticle production for simultaneous controlled drug delivery, diagnostic and treatment of cancer, diabetes, and cardiovascular diseases, and further translation of these nanotechnologies into the clinic. He is the author/co-author of more than 220 publications, including reviews, journal editorials, book chapters and 3 patents (> 4265 citations, h-index = 40), and more than 200 conference proceedings/abstracts. Dongfei Liu is a Postdoctoral Fellow and PI at the Division of Pharmaceutical Chemistry and Technology, University of Helsinki, Finland. He has developed a versatile and robust microfluidics platform to prepare extremely stable drug nanocrystals. Hongbo Zhang is an Assistant Professor at Åbo Akademi, Finland. His research focuses on nanostructured materials prepared by microfluidics for drug delivery applications.